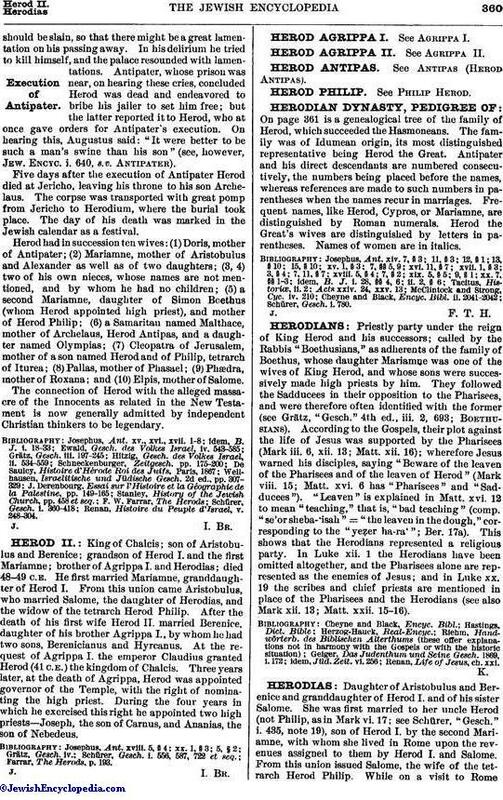 On page 361 is a genealogical tree of the family of Herod, which succeeded the Hasmoneans. The family was of Idumean origin, its most distinguished representative being Herod the Great. Antipater and his direct descendants are numbered consecutively, the numbers being placed before the names, whereas references are made to such numbers in parentheses when the names recur in marriages. Frequent names, like Herod, Cypros, or Mariamne, are distinguished by Roman numerals. Herod the Great's wives are distinguished by letters in parentheses. Names of women are in italics.